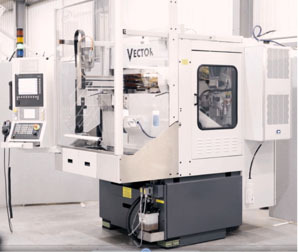 The Curtis Machine Tools “Vector™” is a growing range of machines, each variant of the range having qualities suited to niche applications or solutions. The Vector basic unit is a compact small-parts production grinding machine, in which grinding and parts handling are fully integrated. All of the Vector machines in the range share the same grinding platform, with a long radial stroke and a short axial stroke, for single and multi-plunge grinding or peel grinding of short profiles. The grinding wheel guard houses the workpiece and rear dresser, incorporating a shutter for loading access. Grinding fluid and debris is retained within the machine. A variety of work locating and driving solutions is available, able to be configured for straight or angled approach with optional in-process gauging. The machine functionality incorporates a 3-axis robot and a transitional parts storage area. Parts can be buffered in pallets using drawers, or transferred in and out using linear systems. Secondary processes, such as pre and post gauging; orientation; deburring, are possible. The layout enables good integration possibilities into the wider manufacturing environment, whether using manual transfer of pallets or linked linear transfer. Ergonomics – Designed to maximise output from available floor space and labour resources. Low operator attendance is achieved with the inbuilt parts storage system, the small footprint being consistent with compact cell structures. Lifetime – Economy Providing dependable precision and high cycle rates, whilst simplicity and economy of design means unplanned maintenance is infrequent and, if necessary, simple in nature. Machine wear parts are specified for long lifetime and easy replacement. Cleanliness – The small grinding enclosure allows dirt and debris to be fully flushed away by the coolant, away from contact with the operator. This means that working parts remain clean, prolonging the machine’s life and improving reliability. Consistency – Benefits arising from the small size and rigid construction are good thermal stability and high static / dynamic stiffness, reducing the warm-up and spark-out times. Flexibility – A wide range of options exist for work handling, work holding, wheel dressing, gauging and monitoring, plus possibilities for extra operations such as part orientation, pre-gauging or de-burring. Longevity – When the original application comes to an end and a significantly different requirement arises, we can offer a feasibility study service, including re-tooling and re-qualification of the machine and if necessary, updating to current Vector or industry standards. Basic – The core machine of our brand, with conventional workholding and Cartesian robot workpiece handler. The Basic variant has a wide application range and the greatest potential for future re-tooling on other components or applications. Concentric – A centreless grinder with steel control wheel, workrest blade and ‘concentric’ pressure roller. Typically used for secondary operations on parts having a cylindrical body. Loading can be performed via a hopper or vibratory feeder. Twin – The Vector Twin incorporates an indexing twin-spindle workhead, allowing loading (and some secondary operations) to be performed concurrently with the grinding process. This gives advantages when the grinding times are short. GFS – A barfeed unit with puller unit and cut-off blade enables parts to be Ground From Solid rod. Unload can be by gravity or robot. The variant is advantageous when parts to be ground are less than 5mm in diameter. Rotary – The Rotary variant uses a special workhead mounted in a programmable ‘B’ axis. 3 axis simultaneous interpolation is possible for the generation of forms in materials not suited to plunge grinding.